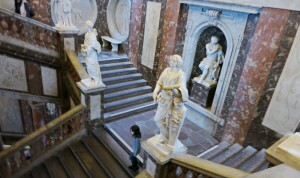 The grand staircase, built on the site of an old church. The wall looks like marble stone but is actually a painting. 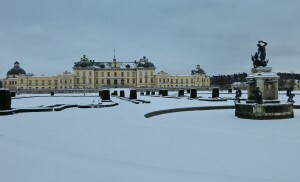 Drottningholm is the Swedish royal family’s residental palace. It has a lovely view across Lake Mälaren. 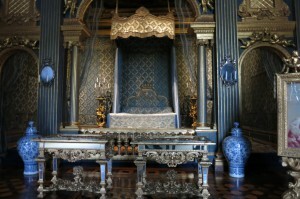 The palace was intended for king Johan III’s wife, ergo it got the name Drottningholm in 1579. Drottning in Swedish means queen. Alas, the queen died before the palace was finished. 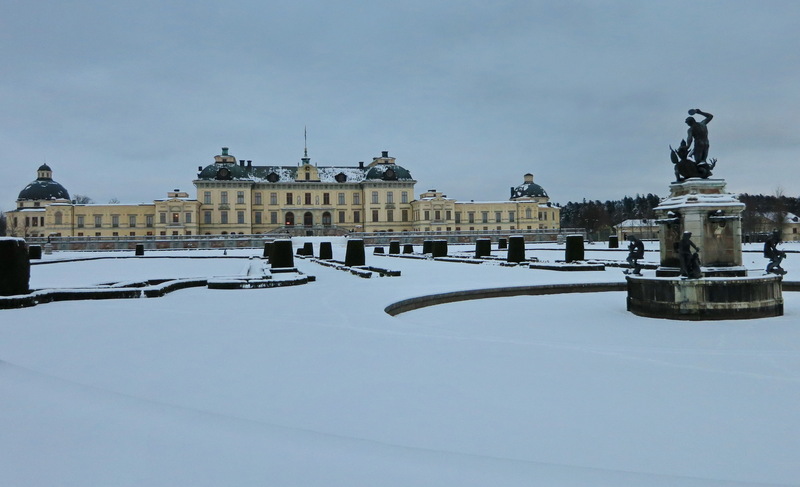 In 1661 the palace was bought by a 25-year old queen, Hedvig Eleonora, who was a widow and with a little son. She had ambitions to turn this palace into something spectacular, Sweden’s most impressive country palace. 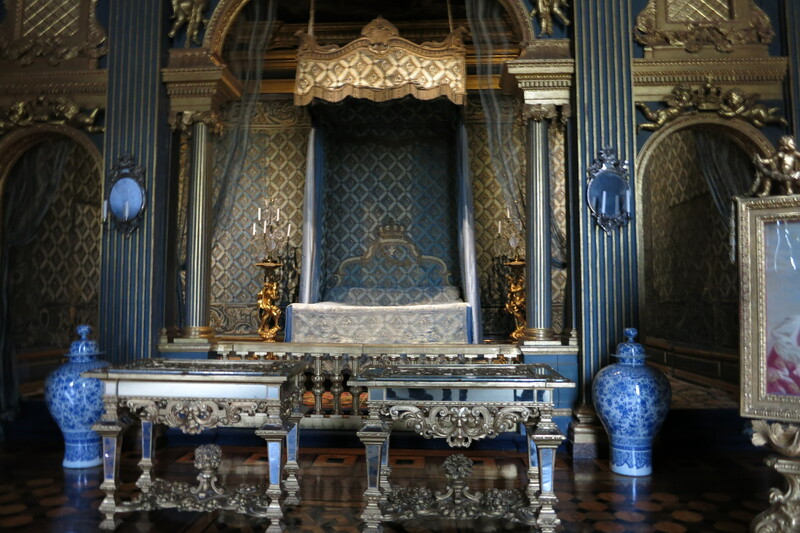 The state bedchamber has gold leaf (thin wafers of genuine gold) painted on its walls. It took many years to rebuild. Just the state bedchamber took 15 years and the grand staircase and the upper halls, 30 years, according to the book “Queens and Kings, Castles and Things” by Gitten Skiöld and Magnus Bard. There were other problems, too, like the marshes with mosquitoes that spread malaria. So the palace was hardly used. If ever the royalty came, it was only for a day. Years later, when another king, Gustav III, reigned, he saw to it that the mosquito-infested marshes be turned into canal to get rid of the problem. I pity the workers who worked by hand and got sick from digging there. But they sure did a good job. 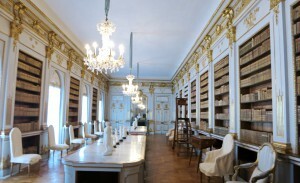 The old queen, Lovisa Ulrika, collected many things and stored them in the library. This so-called theater king, Gustav III, was cousin to this historically popular Russian czarina (she was actually of German origin but married the Russian czar) known as Catherine the Great. She gave him ideas for his palaces in Sweden. A room I like in this palace is the library that houses 20 000 books. I’ve always liked coming to the palace, its park and surroundings. Before I became busy with motherhood, I was always there in the weekend to walk around, especially early spring mornings, when the chance of seeing wild deers was high. When my aunt came to visit Sweden, I brought her there. Drottningholm is the private residence of the Swedish Royal family. A part of it is open to public. We picked up Zion and in the car, both kids were initially quiet. But in the palace, they started feeling at ease. We joined a palace tour for kids and a treasure hunt, which the kids enjoyed. 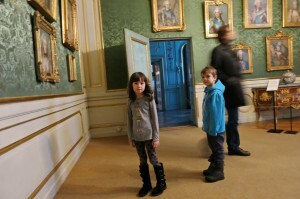 The kids look at royal portraits and wonder why princes wore gowns like princesses. 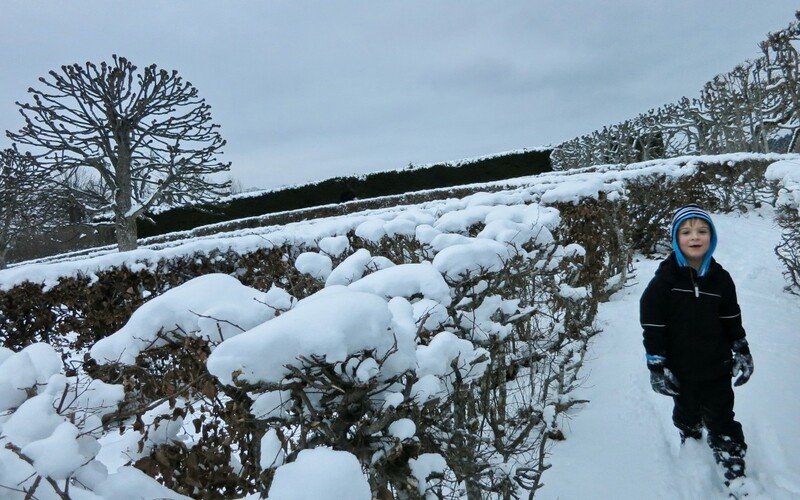 There was a coffee shop nearby, so we reenergized there before running towards the castle park, where the kids enjoyed climbing a huge pile of snow and running around labyrinth bushes. An afternoon at Drottningholm cost us a total of around 600 crowns, and that includes the entrance and tour, souvenirs (the book I mentioned above plus chocolates) and the snacks at the coffee shop.